Where do I use my Online Golf voucher code? Founded in 1999, Online Golf presented the solution to expensive and out of reach golf stores for the masses - extensive quality products, affordable pricing and first-rate service from the website to your door. Online Golf is proud to be the one-stop shop for everything golf related and more; whether you’re seeking an individual club, an entire set of irons or anything in between, the Online Golf experience is stress-free shopping and kitting yourself out from the leisure of your own home. You really needn’t go anywhere else, Online Golf has it from A-Z: woods, irons & putters; attire, accessories & equipment - the very best brands and across all price points. There’s no need to break the bank when shopping for your favourite hobby, Online Golf loves giving their customers options through the generously discounted clearance sale - check it out and bag a bargain. If Online Golf is right up your street then you should consider subscribing to their newsletter mailing service, it’s entirely free and you can unsubscribe at any time you like. Simply input your email address in the provided form on their website and you’re good to go. Subscribers have priority access to all the latest product news, special offers and promotions - plus much more! Online Golf is known to release exclusive offers and sales to newsletter subscribers - so make a note to keep up to date! If you like what Online Golf has to offer then you’ll love their clearance sale, huge discounts across a range of items - reductions of up to 50% off RRP and 3 for 2 offers can be found. All the same quality products you can expect to pay full price for anywhere else, only at the fraction of the cost through Online Golf; big brands such as Under Armour, Nike and Adidas, are all included in this jaw-dropping clearance. Perfect for a golf lover's birthday present or stocking up early for Christmas, with prices this low you can’t give it a miss! What is the Online Golf contact number? What is the Online Golf contact email? Delivered within 3-7 working days (Monday to Friday excluding UK Public Holidays). Order before 5pm to receive on the next working day. Orders placed over the weekend, and after 5pm on Friday will be delivered on the following Tuesday. 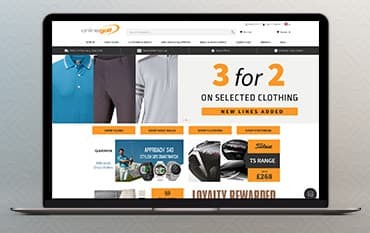 Online Golf has been a dominating retailer within the golfing industry since its establishment over 20 years ago, growing into the largest internet-only retailer in Europe. Whether you’re a newcomer to the sport or a life-long fanatic there’s undoubtedly something suited for you with Online Golf; from clubs, clothing and shoes, to bags, balls and accessories, plus much more! You can be rest assured that you’re always in safe hands with Online Golf, being an authorised supplier of big brands such as Callaway, Garmin and Srixon, just to name a few - you’ll never receive anything less than the genuine article. There are plenty of ways to save when shopping with Online Golf, ensure you always shop with an Online Golf discount code from us to get the most for your money!